There is clearly something amiss when at least dozen major planning applications do not get a hearing at a Melbourne City Council meeting because a majority of Councillors have received electoral donations from the developers concerned. When this occurs, there is no quorum, the proposal is not debated, and whatever the planners recommend becomes the Council’s official position. MHA’s position is that it’s a very bad look to take money from developers because of the conflicts of interest it sets up. Donations from developers in NSW at all levels of government are totally banned for this reason. But you might ask how this concerns a heritage lobby group ? Well, it seems obvious that Councillors who accept donations from developers, even while excluding themselves from voting may be more likely to be development friendly, both because they accepted the money, and because it implies they are pro-development in the first place. Councillors that are development friendly are more likely to see heritage as an impediment rather than as asset. 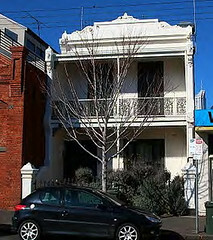 For instance, the charming Victorian era coach factory at 40 LaTrobe Street was demolished in 2012 after the Lord Mayor and his team decided controversially to vote on the proposed replacement BEFORE considering the officers recommendation that it be heritage listed. Once they’d said yes to the tower, and so yes to demolition, heritage listing was effectively off the agenda. Comments made by Councillors before the vote gave primacy to Council ideally not ‘changing the rules’ on a property owner, and cited the abundance of tall developments in the area already, which clearly privilege developer-friendly arguments over heritage ones. 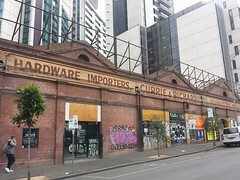 Council has recently undertaken some major heritage initiatives such as the 2011-2013 ’99 buildings’ amendment, a major re-write of heritage policies now under way, and it has initiated a new CBD–wide heritage study. But it remains the case that whenever individual unprotected buildings are threatened that clearly should should have protection, our pleas for action always fall on deaf ears at Council. A process that led to the loss of the Robb’s Building annex last year. MHA is very pleased to report that there is has now been some movement at Council towards addressing the issue. Early April, the Lord Mayor was still refusing to name his donors publicly. Then on April 21, a motion to Future Melbourne Committee by Cr. Jackie Watts for a voluntary register of donations to be set up prior to elections was voted down by the Lord Mayor and his team, in favour of a similar but more detailed motion put by Cr. Stephen Mayne. Then on April 22, the Lord Mayor went one step further, stating he would be ‘unlikely’ to accept donations from developers, who make up around one quarter of his total donations. This all goes some way towards dealing with the various issues raised by two reports over the last few years that looked at the unique voting system for Melbourne City Council. Melbourne City Council differs from other municipalities in that the Lord Mayor and Deputy are directly elected, and businesses get two votes instead of residents’ one. Developer donations to the major players at MCC are also significantly higher than in other Victorian municipalities. In September 2015 a report was commissioned by the Electoral Regulation Research Network (a national network of Electoral Commissions and academics) entitled Melbourne Democracy – Marvellous? : a Review of the City of Melbourne Electoral Processes. The report found the main voting groups in 2012 were the borough’s 50,000 municipal residents who are Australian citizens, and another 50,000 property owners who live outside the municipality. While voting for both these groups is compulsory, there were also 50,000 non-citizen residents (the majority being overseas students) who can’t vote unless they own their own property directly, however voting for this group is not compulsory and few actually do so. One independent 2014 review of local Council elections commissioned by Local Government Victoria made numerous recommendations, including that business in the City of Melbourne get only one vote, and that donations from all businesses or individuals be capped at $1000. Nothing further has been heard of this report since its release. One of the main conclusions was that whoever spent the most money during the campaign became the most recognised name and therefore the most likely to win the mayoralty and the most candidates. This is because those with more to spend can afford expensive mailouts, ads, banners and the like. In 2012, Team Doyle spent nearly $400,000 and won the Mayoralty, Deputy Mayor and three other seats, while the next highest spend was $67,000 from the Melbourne Living team, which saw only one candidate elected. The 2015 research also found that the provision granting business owners in Melbourne two votes was probably not a major influence in the outcome, since in the 2012 election these business votes accounted for only 18% of the electorate. Both of these reports recommended numerous systemic changes but to date nothing has come of them directly. In the interests of producing a set of Councillors that is less beholden to developers, MHA strongly supports reforms aimed at restricting business to one vote, as only seems fair. MHA particularly supports any moves towards the capping of electoral donations from businesses, and that as in NSW developer donations should be banned entirely. So it is welcome news that the Lord Mayor has voluntarily said that he will not accept such donations. If the principle is good enough as a voluntary one, perhaps now it should be written up as a code of conduct for all future City of Melbourne elections ? Find out more about the Victorian Local Government Electoral Review HERE. Find out more about the Electoral Regulation Research Network Report HERE.